Abstract: Roughly one third of the food is lost worldwide yearly. Much of the loss happens during transport. With the emergence of information and communication technology, new intelligent ways of arranging food transport can be developed. By making transport more intelligent and efficient, the loss of food can be reduced. 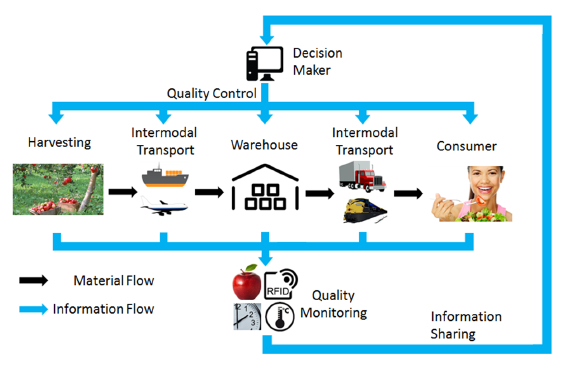 This survey performs a review on three critical aspects of food transportation, for considerations of an intelligent food transport system. Firstly, the indicators that re ect and factors that affect food quality are discussed. Then, shelf life modeling approaches are analyzed. Thirdly the impacts of shelf life and information technology on the transport system are discussed. Although great achievements have been made, there is much room for further research, as this survey points out, in order to establish a quality-oriented transport system for less food loss. Reference: X. Lin, R.R. Negenborn G. Lodewijks. Survey on operational perishables quality control and logistics. In Proceedings of the 6th International Conference on Computational Logistics (ICCL'15), Delft, The Netherlands, pp. 398-421, September 2015.